The CycleShell from cycleshell.com in Boulder Colorado seems an ideal storage option for the BugE. The waterproof base prevents ground moisture from entering the shell. 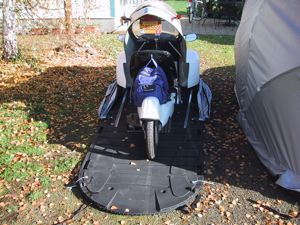 We added aluminum guide rails to the cycleshell base to insure that the BugE is centered since the BugE is as wide as the base. 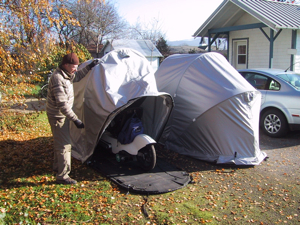 Pictured are the "Tourer" CycleShell.